Listed below are some projects and resources that you should find of interest if you are growing a business or transitioning into a new phase of life whether voluntarily (bit by the entrepreneurial bug) or by force (company downsizing/reduction-in-force). This website is for you to serve as a forum for idea generation so please share your thoughts and ideas on topics you wish for us to explore either on our syndicated radio program Mastering Your Money" "
You can also sign-up to receive our weekly e-newsletter that provides cutting-edge tax, financial planning and business building tips to help spark questions and action plans so you can personally take control of your life. Whether you are a seasoned or early-stage business owner you should plan to add these books to your personal library to help accelerate the growth of your company. 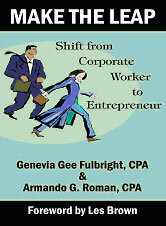 Make the Leap: Shift from Corporate Worker to Entrepreneur is for the small business owner who is interested in taking control of his/her life. Why not generate income for yourself and fully utilize those skills and talents that have gone untapped far too long. If you are serious about realizing or expanding your entrepreneurial dreams, consider this book. Go from start-up to finding angel investors to franchising to taking it public! Eliminate the regret! Make the leap from worker to entrepreneur and soar. Make the Leap: From Mom & Pop to Good Enough to Sell is for the growing, exiting and legacy building entrepreneur. 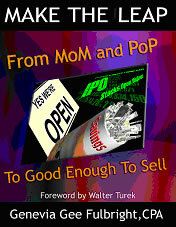 It includes thousands of dollars worth of practical entrepreneurial advice for less than the cost of a dinner out. If you are at a crossroads with your business, desiring to grow from a small operator to a larger enterprise, you are certain to find some new tools that will help you continue on your path to success. Meet the Member "Genevia Gee Fulbright"